Reception for the exhibition in conjunction with Third Friday events in downtown Lafayette, featuring performer Jeris Eikenberry in Fountain Gallery. Kathryn Brownell, assistant professor of history, will discuss the beneficial relationship between country music and conservative politics in the 1970s and '80s, in Fountain Gallery. a reception will feature music by James Moon and the 3rd Floor Invention, in Fountain Gallery. 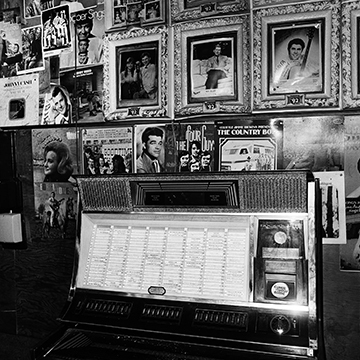 Honky Tonk is a collection of photographs taken between 1968 and 2010 that documents the changing world of country music and its fans. Shot in bars, music ranches and famous venues like Nashville’s Ryman Auditorium, Horenstein not only shows us the performers on stage, but also the dedication and love the fans have for the performers and the music. Horenstein began this project at a time when he saw the world of country music changing and wanted to capture it as it was before it turned into the big business that it is today.